White gloss apparel boxes are packed 5 per pack. 15x9.5x2" is great size for long and short sleeve shirts. 2 pc boxes are 100% Recycled - Green Way ® Eco-Friendly Packaging. Made in the USA. 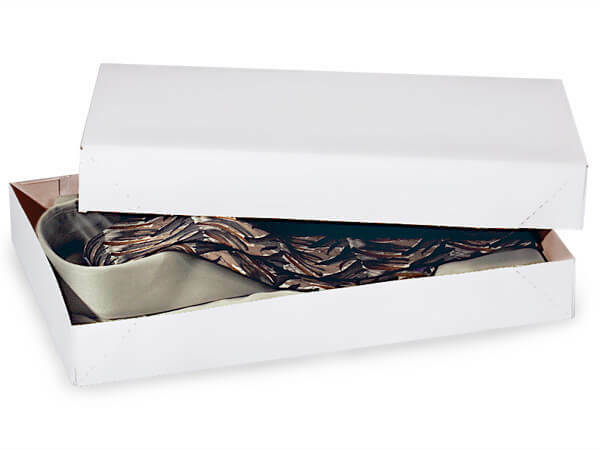 100% Recycled White Gloss Apparel Boxes are made in USA. Interior color will vary from light gray to brown kraft. These shirt boxes are easy to assemble 2-piece pop up design. Custom printing available on single size cartons, assortments not included.